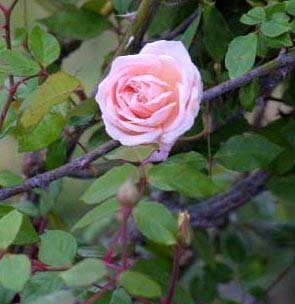 I read that `Madame Driout' could be planted on pillars and trained as a climber, so we planted her on four pillars in the Gertrude Jekyll formal garden. It has been a slow climber, but it still blooms all the time. The blooms are multi-colored pink and carmine. It should be dead-headed regularly as the spent blooms are not very attractive. The fragrance is intense. Canes are supposed to reach 10' in length. Bred in 1902 by J. Thirat.